Effective global cash management requires an intricate balancing act to stay abreast of cash levels and optimize balances, transfers, and other actions. Finance staff need continuous real-time visibility into all cash accounts as well as overall roll-up status, so that deficits and surpluses can be identified and resolved immediately. Centralization – Leveraging technology to unify fragmented cash account landscapes, such as legacy systems, in order to see the full picture within a single-source-of-truth. Optimization – Integrating process automation solutions, such as machine learning, AI, etc. to reduce dependence on manual activities and free up finance personnel for higher-level tasks. Agility – Building in the ability to rapidly adapt to changing conditions, to predict what’s going to happen, and to take real-time actions to optimize cash status. Visibility – Providing accurate real-time cash status information, along with the deeper analytic tools to help you make the right decisions. 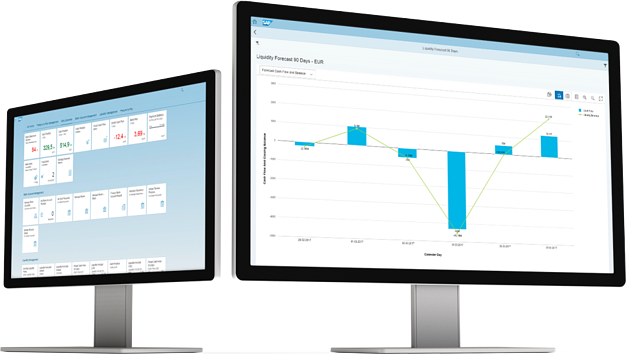 Insights – Being able to forecast where your business needs to be and to maximize cash assets to help you get there. Fortunately achieving these goals doesn’t require a complete overhaul of every existing cash account and process throughout the whole enterprise. Instead it can be achieved with comprehensive solutions, such as SAP Cash Management, that provide an agile and flexible solution to bring all of the disparate pieces together into a single highly manageable picture. Using a single-source-of-truth approach enables finance staff to keep control of multiple bank accounts and track global bank balances, along with streamlined processes for sweeping balances, opening or changing accounts and directly connecting with financial institutions. Cash and liquidity management is also improved by empowering treasury professionals with the visibility and tools that enable them to immediately trigger any necessary actions from within the SAP Cash Management application, regardless of which legacy systems may be involved with handling localized cash accounts. Companies can also use the centralized application to simplify payment management by connecting with multiple banks using a variety of different payment standards and data formats. This provides a highly integrated solution for streamlining inter-company payments and to optimize working capital. The bottom line is that cash is still king! However, for most companies the kingdom of cash has become increasingly complicated by the diverse, dynamic and often fragmented processes involved with managing legacy cash environments. Fortunately, there is now a better path forward by leveraging new technologies that integrate and unify all of these enterprise-wide cash activities without throwing everything away and starting over from scratch.